Nora's Ovenworks, the home style bakery offers birthday parties and classes for kids and adults at their bakery in Harrison. There are several options for kids parties from cookie parties, cupcake parties, fondant, fondant painting parties, and cupcake wars for older kids. If you can think of a theme, they can build a party around it. Suitable for 5 years and older. The parties are priced on a per child fee, starting at $20-$45 per child. Each party includes, paper goods, bottle water for the guest, a small birthday cake for the party and a personalized apron for the birthday child. They can accommodate 15 kids max. World Cup Gymnastics also features popular birthday parties that'll make you flip! These unique, fun-filled parties consist of an hour of supervised gymnastics activities and 40 minutes in your own private party room. No work is required as your own personal attendant will set up, serve, and clean up for your party. Gold party packages are available in which pizza, drinks, and table settings are included. We also offer parties in our Romperee indoor playground across the way at World Cup Nursery School & Kindergarten for children under the age of 3. There are multiple time slots for parties on both Saturdays and Sundays and plenty of openings available. There's never been a better time to schedule a birthday party at World Cup Gymnastics. Parties for children under 3 are for a maximum of 25 children with parties for 4 and over are for a maximum of 30 children. First 15 children - $20 each additional child up to a maximum of 25. 55 minutes of supervised Romperee fun AND 35 minutes in your own private party room. HELP with pre-party set-up and post-party clean-up. Complimentary World Cup Romperee Shirt for the birthday child. Customized World Cup Romperee Invitations ready for you to mail. Suitable for ages 1 - 10 years old. Kids will undoubtedly enjoy this fun, creative, and interactive party experience where they get to become a "Chocolatier for the day". Kids will have the party of their "sweet dreams" as they are allowed to mold and decorate their own, one of a kind chocolate creations. The fee for the standard party is $695.00. Add-ons and substitutions are available on request and will require adjusting the standard fee. At the time the party is booked, a non-refundable, non-transferable deposit of 50% is required to hold the date and time slot. The balance of the fee is due on the day of the party. If you cancel your party for any reason and we are able to re-book the time slot, we will refund your deposit. If we cannot re-book the time slot, your deposit will not be returned. If we cancel your party because we determine that the weather is too dangerous for people to travel, then your deposit may be applied to re-booking the party on another date. However, if you choose not to re-book the party, your deposit will not be returned. Every child must be accompanied by an adult caregiver. 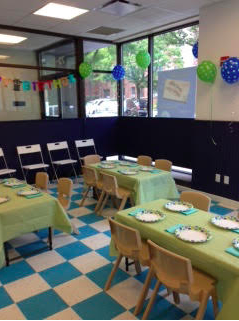 To schedule your child's birthday party, please contact the office at (914) 722-2025. Birthday parties that can be held at their Center or they can come to your home!